Our water damage Milwaukee team at 911 Restoration Milwaukee provides not only the fastest water damage restoration services in the industry, but also the most affordable. Regardless of the extent of your water damage, 911 Restoration is available 24/7/365 to dispatch a team of qualified water damage West Allis specialists out to your home to employ our state of the art water damage restoration services. Our fast teams respond within 45 minutes and with that, not only will your emergency be addressed quickly, but when you learn about 911 Restoration you will discover that because we solve problems fast, your out-of-pocket repair costs will be kept at an absolute minimum. You and your home matter to us and the goal of our water damage West Allis team is to always to get you back into your house as quickly and safely as possible at the most affordable price for you and your family. Water damage and related losses associated with it has the potential to wreak havoc on your home and your finances. So if you’d like a free inspection of your West Allis area home or if you’re need of emergency water extraction services due to a severely flooded basement, give our water damage West Allis team at 911 Restoration a call today! Water damage in a basement is a serious concern for homeowners because the basement serves as the foundation of your home and when the walls and ceilings absorb infiltrating water the structural integrity becomes at risk. In the event of a broken hose or faulty plumbing that floods your basement our water damage West Allis experts state that the first step to prevent water damage is to shut off the main water line. 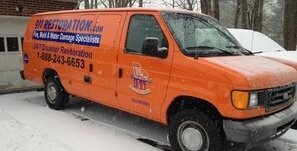 Our water damage West Allis pros know that a flooded basement is something you never expect and can seem like a daunting task, but our experts at 911 Restoration are equipped with the best and latest equipment to handle any job, big or small, with relative ease. We know that insurance covers some forms of water damage but often times doesn’t cover mold which is we eliminate all signs of moisture in a home fast, every time. We truly care about your family’s finances and want to make sure you get the coverage you deserve, so call us today so we can take care of every step of the restoration process for you! Water damage is often covered by a standard homeowner’s insurance policy but our water damage West Allis insurance experts also highly recommend regular maintenance of your home as well as routine inspections by 911 Restoration to ensure maximum coverage. Although many water emergencies are covered by insurance some, like mold, are in fact not. Our water damage West Allis technicians always work hard to eliminate all traces of mold and work just as hard to get water damage claims covered for our clients. We know that when you live in area like West Allis, water can originate from anywhere. West Allis, Wisconsin is a beautiful suburb of Milwaukee that during winter months experiencing forces of harsh weather that combine with moisture from the local Root and Kinnickinnic Rivers to create a perfect storm for all sorts of water damage to occur. With 35 years of experiencing serving the area, we’re here for you and your family and will always respond within 45 minutes of your call to ensure that a simple water damage problem doesn’t turn into a bigger flooding or mold disaster. We do this because we’re the best in the business and the community of West Allis deserves just that, the best, so pick up the phone now and give our water damage West Allis specialists at 911 Restoration Milwaukee today!